When you stay at Lake Pointe Inn this summer, you’ll have a variety activities to keep you entertained. Along with getting out on the water, hiking, boating and biking, the area has several special events as well. A great cultural activity to take part in during your time in Deep Creek Lake this summer is the 27th Annual McHenry Highland Festival. Celebrating it’s 27th year, the 2014 McHenry Highland Festival will take place Saturday, June 7th. Held at the county fairgrounds, the festival celebrates the traditions and culture of the Celtic people. Activities at the Highland Festival include music, dance, games and animal demonstrations. The McHenry Highland Festival also holds competitions and exhibitions. The amateur Scottish Heavy Athletic competitions includes the signature “caber toss” present at most Celtic events as well a Scottish hammer throw, stone throw, and more. Along with the traditional games, the Highland Festival is a great place to learn about Scottish and Celtic history and clans. 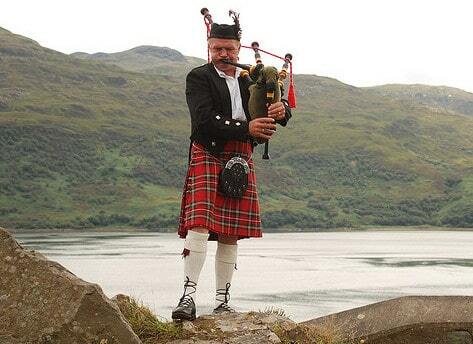 Music at the festival will be provided by Celtic bands including the host band Garrett Highlands Pipes & Drums. Other participating bands include Shanty Irish, Harpist Lynne Barnes-Dale, Greg Latta, Uilleann and Northumbrian Pipes, Aurora Celtic, and City of Winchester Pipes & Drums. The most prominent instruments at the McHenry Highland Festival are of course the bagpipes. Bagpipes were first used in battle to intimidate adversaries, but now they’re used in traditional celebrations just like the McHenry Highland Festival in “walkabout” processions. There is nothing that sets the mood for a Scottish or Celtic celebration better than bagpiping. Along with the music, Highland dancing is another signature of the festival. Highland dances will be on display in competitions and performances in various age groups. Highland dances “combine steps and footwork with arm and hand movements.” Local dance troupes and schools will be at the festival to show off their moves. Check the website to see the full Events Schedule. Another part of the McHenry Highland Festival that visitors love year after year is the variety of animal and livestock demonstrations. Sheep have historically played a big part in Scottish culture, so herding demonstrations are a big draw at the festivals. To herd the livestock, a variety of Scottish, Irish and Welsh dogs will be on hand in a “Pat and Chat” area. Other livestock that you can expect to see at the McHenry Highland Festival are Scottish Highland cattle, which can withstand harsh conditions, making them ideal for the Highlands. Falconers with hawks and falcons will be in attendance at the festival, so you can learn about the art of using a falcon to hunt. While you’re making your plans to attend the 27th Annual McHenry Highland Festival, don’t forget to book your stay at Lake Pointe Inn. Our McHenry bed and breakfast is the ideal place to relax in between taking in all the local festivities and attractions. Our lakeside location means many of our luxurious rooms and suites have amazing views of the water. And while you’re with us, you can take advantage of our massage treatments that are exclusively for inn guests. And, of course, your stay includes a complete breakfast each morning. Come to Lake Pointe Inn and have the ultimate Deep Creek Lake experience. We can’t wait to see you!